Lishiu International Photography Festival, China. Jurying for Photolucida’s Critical Mass is an opportunity to catch a glimpse of the current state of fine art photography. Which is why I get very excited when that time of year comes around both as a curator and artist. For me, this year was a return to the process after taking a couple years off from jurying Critical Mass as a pre-screener. The pre-screening process is intense. This year I opted out of prescreening so I could really focus and spend more time with the top 200. The diversity of selections was outstanding and a lot of work is in line with our philosophies on photography over here at One Twelve. There is a lot of work challenging the notion of what photography is – or can be. Below you’ll find six of my favorite portfolios (in alpha order) from this years top 200, four of which made it into the final top 50. Congrats to all the top 200and top 50 finalists. I hope to work with some of these folks in the near future! I am thrilled to be exhibiting for the first time at the Catherine Couturier Gallery, in Houston, Texas. Opening Reception October 21st, 5-7 pm. Fire & Ice, 2017. Archival pigment prints, gesso and thread, mounted on wood panels. Honored and humbled to receive the news that I am one of the finalists for Photolucida Critical Mass50 among so many talented artists. Thank you to the reviewers for selecting my work! I am honored to be featured with these talented artist to celebrate Fraction Magazine's 100 ISSUE!!! Thank you Bree Lamb and David Bram for your support! One of my works has been invited to take part of the Atlanta Celebrates Photography Auction Gala 2017. I am excited to be part of the Schneider's Summer Showcase exhibition at Schneider Gallery, Chicago. If you are in the area August 5th -30th please stop by! My Collaboration RPM Project is thrilled to be part of this Exhibition dedicated to showcase the works of female video-artists. Organized by TRIAD in London, UK, the exhibition focuses on a group of six artists and their approach to social and political topics and gender issues through the medium of video art. Participating artists: Lucia Pizzani, RPM Project, Antonia Wright, Einat Amir, Charlotte Ginsborg, Sarah Turner. Honored to have one of my works from "The Weight of Things" series invited to participate in the Museum's Ball & Auction. February 20, 2016. I finally received my copy of GEOGRAFIE, Reppresentazioni del Mondo tra Arte e Design, Edizioni Corraini. Thrilled to have "Dos Mundos" featured among the works of so many talented artists! Dos Mundos, from the Imprinted series. Home, Sweet... is featured @ At Home, a beautiful online exhibition by Don't take Pictures Magazine. We had the pleasure to exhibit our project Instacorrespondences on it's 5th installment @ La Plataforma, Barcelona as part of DOCfield15, a Documentary Photography Festival during the month of July- September, 2015. We have the pleasure to exhibit Instacorrespondences, a collaboration with artist Amalia Caputo, on it's 5th Installment at La Plataforma, Barcelona as part of DOCfield15, a Documentary Photography festival across the city. Thrilled to have The Weight of Things published on a 8 page spread on the June issue of PHOTO+ magazine, Korea. Honored to announce that Conversations Over Coffee/Conversations Over Tea is now on the MDC Museum of Art+Desig's permanent collection. 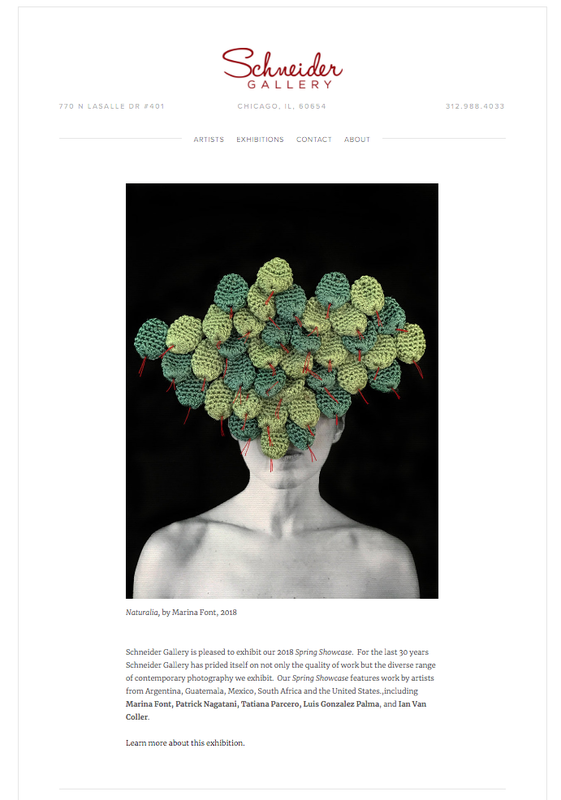 I had the pleasure to meet Elisabeth Avedon last April @ Photolucida and the honour to have my series featured on her blog! Photographer Eleonora Ronconi took over lenscratch for a week and invited my series The weight of Things to be published on her Finding Home selections. Dark Continents will be on view at the dina mitrani gallery booth. 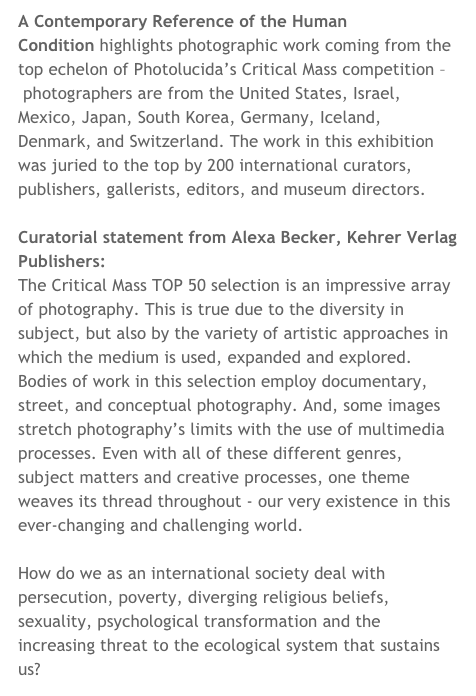 Participating artists: Peggy Levinson Nolan, Alexandra Rowley, Heidi Kirkpatrick, Colleen Plumb, Marina Font, Kanako Sasaki, Sebastian Salgado, Willy Ronis. Thrilled to have such a thoughtfull review of my exhibition Dark Continents reviewed on ART NEXUS magazine! Locust Projects is celebrating it's 15th Year Anniversary with Spring Fling, Art auction. April 27th 2013, 7-10 pm. The Departure will be one of the many great art pieces donated for the event!